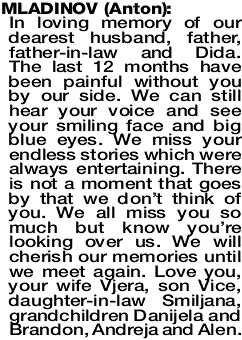 In loving memory of our dearest husband, father, father-in-law and Dida. The last 12 months have been painful without you by our side. We can still hear your voice and see your smiling face and big blue eyes. We miss your endless stories which were always entertaining. There is not a moment that goes by that we don't think of you. We all miss you so much but know you're looking over us. We will cherish our memories until we meet again. Love you, your wife Vjera, son Vice, daughter-in-law Smiljana, grandchildren Danijela and Brandon, Andreja and Alen.